Excellent tour. They spent three hours with us instead of designated two hours, to ensure that we cover as much information as possible. Really great experience. We fully enjoyed this informative tour and Metro NYC Tours’ engaging style. We offer the most comprehensive NYC gangster tour. From the rise and fall of the mob. At the end of the tour you will be a WISEGUY. Visit places ruled by some of the most powerful gangs. Little Italy – where The Mafia or La Cosa Nostra wreaked havoc and mob members were gunned down in the streets. 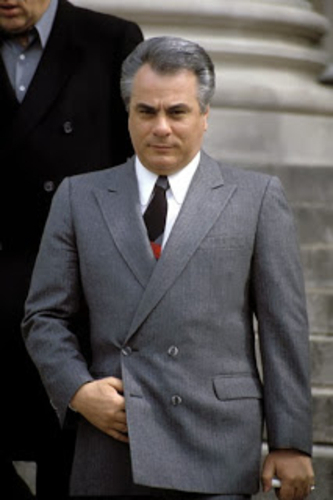 Learn of the demise of the last don – John Gotti. Chinatown – was home to the Tong gangs, where the infamous two Tongs would rage war on each other. The battles were so violent the streets became known as “Bloody Angle”. Explore the underground tunnels and hear stories of their wars. The Five Points – The Gangs of NY – As the Irish escaped the potato famine in Ireland they landed in NY in the most poverty-stricken slum in NYC. See where the five points converged and gang extortion, houses of ill-repute and crime flourished. Contact us if you don’t see your preferred date and time. This now gentrified exclusive area of NYC was once known as “Wicked NY”. On this 2 hour tour we walk the notorious streets of the East Village and Lower East Side where murder and mayhem were part of everyday life. We will explore places that were home to crime, prostitution, murders, grave robberies and more. Hear the stories of this once densely populated area where Jewish and Italian gangsters met. Where Charlie Luciano, Mayer Lansky and others formed life long friendships that later became the foundation of the Mafia and organized crime. See where they lived, ate, drank, committed felonies or got whacked. We will explore the cemetery site where a grave robbery took place and is still one of the most sensational and ghoulish crimes ever committed. We will visit Tompkins Square Park notorious for riots, encampments for homeless and many illegal drug dealings. It is where a tragic boat fire changed the face of this once German immigrant neighborhood. This is where in 1989 The Butcher of Tompkins Sq. Park murdered his girlfriend dismembered her body and served soup made from her body remains to the homeless. Chicago and the name Al Capone go together like a peanut butter and jelly sandwich. But the most powerful and infamous gangster was born and raised in an immigrant neighborhood in Brooklyn. It is hard to believe that the now gentrified neighborhood of Park Slope, Brooklyn – is where public enemy #1 Alphonse “Scarface” Capone got his criminal start. Join us as we walk the streets and unveil the early life of Al Capone. Capone grew up in a hard-working loving Italian immigrant family that came to America for a better life. He became part of the street gangs at an early age and turned to a life of crime. We will visit his childhood home, the school he got kicked out of for hitting a teacher, John Torrio’s Association Club, and the pool club where he became so good at playing the game he became the neighborhood champion. You will hear how he got his facial scars that gave him the moniker “Scarface”. Capone will always be associated with Chicago but Brooklyn is where he began. Like Al would say “ I‘m no Italian I’m from Brooklyn”. We will also see the Glory Social Club where made men from the Bonanno Crime family got arrested for loan sharking and gambling. Two Tom’s restaurant – a red-sauce joint with limited hours. Monte’s Venetian Room – which was a former speakeasy and hangout of Frank Sinatra – and The Carroll St. Bridge over the Gowanus Canal which was a deadly swamp area, where many bodies and body parts were dumped. Where and when: Meet up on the corner of Atlantic Ave. and 4th Ave. by Dunkin Donuts diagonally across from Atlantic Terminal. Take N,Q,R,D,2,3,4,5 subway to Atlantic terminal Barclay Center. Experience the suspense and thrill of all things gang and mob related on a private fun informative gangster mob tour in a chauffeured deluxe vehicles with a professional NYC tour guide. We will stop at several places around the city as you hear about the beginnings and demise of the “men of honor” of the “Costra Nostra”. 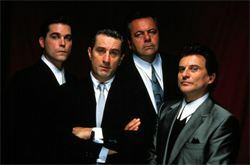 We will take you on an exciting adventure where the infamous “Goodfellas” hung out, got whacked, got made, lived and caused havoc in the streets of this great city. Visit famous places where classic movies got shot – not that kind of bang! This tour can be customized to fit your requests. The vehicle provided depends on the size of your group. Call, email or contact us on the contact page for more information and to arrange this tour. Join us on our informative walking tour and learn about the beginnings of organized crime in America. Hear about the Black Hand or La Mano Nera extorting money from the new Italian immigrants and terror they caused in this very neighborhood. Learn about the first Italian Police Officer that helped bring them down. See where during prohibition a war between bootleggers broke out and people were killed just like in the wild west. Learn about the original “Godfather” and his demise that led to the beginning of the modern day mob. 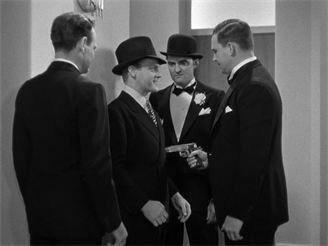 Visit what were social clubs and speakeasies that were run by the Wiseguys. Walk the streets where famous mob movies and TV shows were filmed. 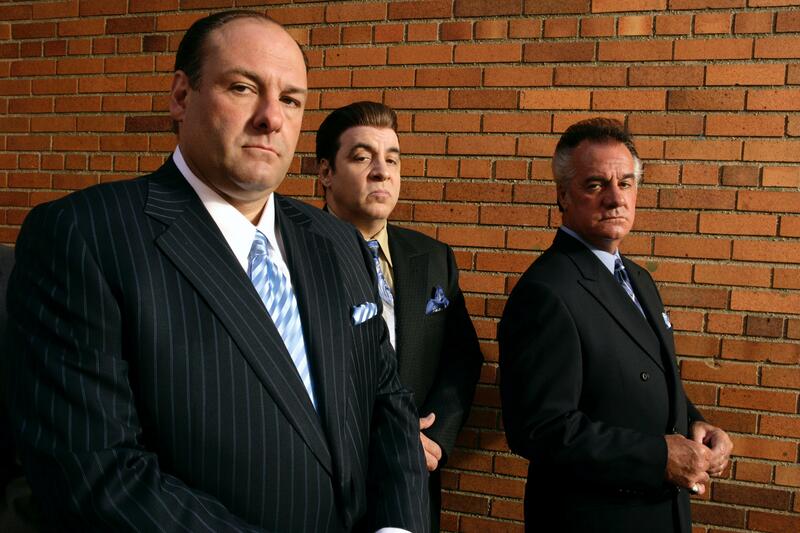 How did such a powerful organized crime syndicate disintegrate? Join us and you will find out. *price of combo tour and meal is all inclusive. 1 drink per person additional drinks available at additional charge. You may order anything from the regular menu but the cost is not included in price. 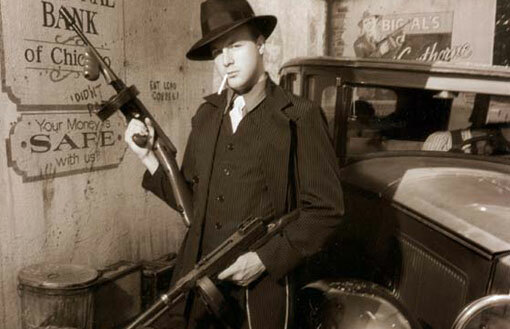 Come relive the past on this three hour exciting Gangster Mob Prohibition Pub Crawl Tour. Your tour guide will help make the past come alive. In 1920, the United States created the 18th amendment to the Constitution which banned liquor production, public consumption and the selling of anything alcoholic. This catapulted the criminal world and helped the gangsters monopolize and grow their illegal business of alcohol. It made some of the most vicious gangsters gain fortune and fame. Illegal bars known as speakeasies opened by the tens of thousands all over the country and served bootleg liquor to the thirsty public. When something is illegal it creates an underworld that will stop at nothing. As Al Capone said, “All I do is supply a public demand”. On this tour, you will walk in the footsteps of the gangsters and visit some of the watering holes that served illegal liquor during Prohibition. There you can sip a craft cocktail or if you prefer a beer or wine or even a shot served by some of the top bartenders in New York. While sipping on your now “legal” alcoholic beverage you will hear stories of the Mafia and how it infiltrated into society. We will stop at three to four pubs; some of which were “speakeasies”. At the end of the tour, you will be a “wiseguy” about prohibition and the mob. Must be 21 to sign up for this tour and must show ID at time of tour. Contact our office to schedule a private tour. After a breathtaking trip on the Staten Island Ferry* where you will get wonderful views of The Statue Of Liberty you will embark on a 3.5 hour mob related private luxury vehicle tour of the “Forgotten Borough”. You will be met at the St. George Ferry Terminal in Staten Island by your guide and driver. Staten Island is one of the 5 boroughs of NYC that has been a haven for mobsters and has seen its fair share in mafia crimes. When the Verrazano Bridge was completed in 1964 some of the wiseguys who lived in Brooklyn migrated to Staten Island. Here they integrated into the small enclaves of where they were virtually anonymous. They opened “legitimate” businesses like pizzerias, restaurants and bars. With Staten Island’s many garbage dumps it was easy to dispose of bodies and other murderous paraphernalia. This fun entertaining tour will take you through the neighborhoods where the notorious Gambino, Bonnano and Genovese families had (and still have ) their homes, and places of work and “play”. You will also visit the film site of Don Corleones house where the “Godfather” movie was filmed. Getting thirsty? No problem let’s stop at the former Drunken Monkey, today the Funky Monkey. This is the bar where Genovese princess and former star of “Mob Wives” Big Ang owned and operated for over 15 years before her passing. *You will need to get to the Staten Island Ferry on your own accord. The ferry is free. The Staten Island Ferry is at the Whitehall Terminal located at 4 South Street in Lower Manhattan below Battery Park. It is accessible by subway and bus. The ferry trip is about 25 minutes long. The Ferry runs 24 hours a day/ 7 days a week. More frequent service, (every 15 or 20 minutes,) is provided on the weekdays during the rush hours of 6:00AM- 9:30AM and 3:30PM-8:00PM, with 30-minute service to follow. On weekends, service is provided every 30 minutes on Saturdays and Sundays. Go to the right hand side of the ferry and go up to the second or 3rd level. Stand on the right hand side outdoors when you get on. From there you will have great views of the Statue of Liberty. Please leave yourself ample travel time to get to Staten Island for your tour start time. With extensive research on Jewish Gangsters and the history of what was a Mensch (a person with integrity and honor) from a good Jewish home turn to a life of crime a powerful presentation has been created. 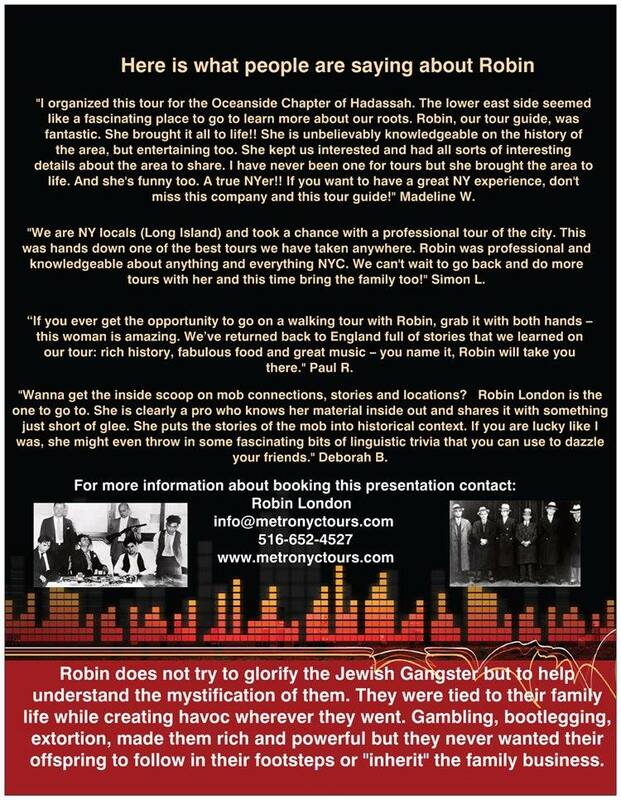 During the course of guiding Gangster tours and Jewish Lower East Side tours Robin learned that many people share this same curiosity. 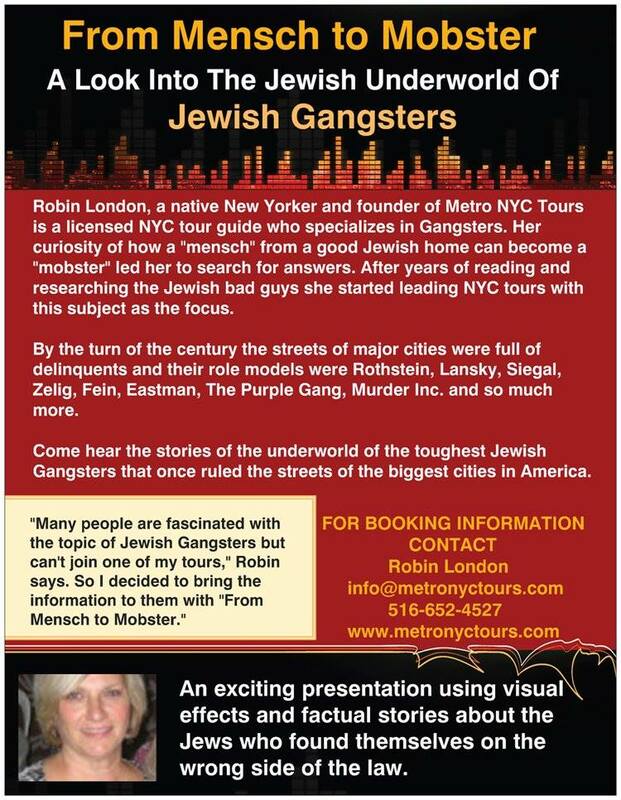 Based on this she has created a Power Point presentation “From Mensch To Mobster” a look into the Jewish Gangster. This presentation is being offered to organizations, temples, libraries, schools and other institutions or individuals. When attending one of her lectures one gains the insight into the underworld and culture that helped create the Jewish Mobster. Stories are shared of how Arnold Rothstien, Meyer Lansky, Bugsy Siegel, Monk Eastman and others climbed the ladder from impoverished slum neighborhoods to the glamour of Las Vegas. This speaking engagement is also available in conjunction with a Jewish Lower East Side walking tour. © 2016 METRO NYC TOURS ALL RIGHTS RESERVED.